Well hasn’t time flown……..it’s seems like only yesterday that you said “I do” to each other, and now here you are 25 years down the line. Has life been kind to you? Probably not, it never is, but you’ve made it to a quarter of a century. Quite a significant milestone indeed. Are you going to let the occasion float by without any fanfares and trumpets? Hope not, because you’ve reached an important stage in your marriage that is definitely worthy of a bit of a song and a dance. A 25th wedding anniversary is a great excuse for a party, but if you’d rather spend it somewhere exclusive and quiet, just the two of you, there’s nothing wrong with that either. So Where Does the Whole Silver Anniversary Celebration Come From? Roman times would you believe it? Not only did they introduce lovely straight roads and indoor plumbing systems, but they started the whole wedding anniversary tradition. 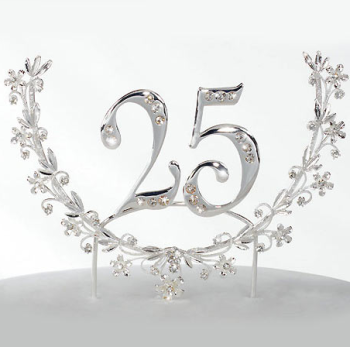 Way back then a husband would crown his wife with a garland made from silver, when they had reached the 25th milstone. And a gold garland if they managed to make it to 50 years. The tradition appeared again in medieval Germany, when friends and neighbours would crown the wife. Move on again to the 20th century, and a number of new symbols were introduced for some of the other wedding anniversaries. There wasn’t just silver anniversary gifts and gold for the 50th. Crystal gifts were associated with a 15th anniversary, and wood for a 5th. Early in the 1900’s the National Jewelry Association in America came up with a whole list of symbols – perhaps they felt that no one year should be missed out. A sad fact is that many more marriages fall by the wayside, than previously. Some statistics say that as many as 50% of marriages end in divorce. Quite sad really, but all the more reason to stand tall and proud when you’ve made it to a quarter of a century, and plan to stay together for much longer. If you’re faced with the task of looking for a silver wedding anniversary gift, whether it’s for your parents, friends, neighbours or your spouse, the options are numerous. Silver is of course the most obvious choice, and you’ll actually be pretty impressed with the variety of things you can find in silver. But if you fancy something a little different there are other materials and symbols associated with this memorable event. There are tonnes of ways you can celebrate an anniversary, but for many it is a fantastic time to gather family members and mates together and enjoy a great time. Some choose to take a holiday, even inviting others along. It could be a great time to enjoy a quiet night in – without the kids of course. A great chance to cook up something a little bit different, lay the table and crack open a bottle of champagne. Gifts for a silver wedding anniversary don’t have to cost the earth. What is most important is that they are given with careful consideration of what the happy couple both like. You could put together a scrapbook of special memories, or create a collage using some noteworthy photos. You don’t always have to put your hand in your pocket to come up with 25 wedding anniversary gifts that matter. There are some great ways you can chart the history of this strong relationship, without having to spend loads of money. Women are renowned for enjoying the whole gift giving and receiving experience, but that doesn’t mean that men don’t like it too. It might be a bit more difficult to find the perfect silver anniversary gift for your husband. But to see the smile that your gift brings to his face, makes all the worry and stress worth it. Silver jewellery is the most obvious choice, but wearing rings, necklaces or bracelets is not always their cup of tea. Of course there’s always cufflinks or tie pins. And you could even choose a silver lighter, fountain pen or hip flask. For something a little bit different there are lots of experiences you can sign him up for. A tandem parachute jump, a day at the races, driving a supercar or a group paintballing session, to name just a few. Being invited to the anniversary celebrations of someone close to you, whether it’s family or friends, is a great honour. But it always raises the problem of finding a gift that isn’t replicated or something they already have in their home. After 25 years of living together they’ve probably already got most of what they need. But let’s look at a few of the options. The woman in your life will always welcome the gift of flowers, whatever the occasion. Buying them as a gift for her doesn’t need to have a reason, they will always be appreciated. But when it comes to your silver wedding anniversary you really should push the boat out. A piece of silver jewellery will definitely be a welcome choice. Earrings, pendants, necklaces, bracelets or rings – whichever you think she’d prefer. Take the opportunity to get the item engraved with some loving words and you might be a contender for husband of the year. Moving away from the traditional offerings how about whisking her off for a holiday – either to your honeymoon location, favourite spot or to pastures new. You could renew your weddings vows and then have a good knees up with all your invited guests. Do you remember the song that was played for your first wedding dance, or the tune that was playing when you first met? If you do then we have to say well done. You can get a CD of said tune mounted in a picture frame, or the words immortalised in a framed print. Relax, lie back and enjoy – a spa weekend for two. There are a wide variety of locations that offer this option for anniversary couples. Enjoy the relaxing atmosphere, fine dining and loads of different treatments. Feel the stresses of your normal days drifting away, while your eyes and ears take in the peace and quiet. Feel a little special for the day – enjoy a taste of the finer things in life. Why not take yourselves away for an experience that’s different than the normal run of the mill routine. There are lots of different experiences to choose from, so be a bit indulgent. Take a picnic and enjoy a classical concert in a stately home, cruise up and down the river and enjoy lunch along the way, explore some of your local history and learn more about the area’s heritage. Tickle your palette – wine tour and tasting. Whichever country you may live in, there is likely a local vineyard that opens its doors for tours and tasting experiences. And if there isn’t anywhere close by, then take yourself off to one of the countries that have a bit a reputation for fine tasting wines. Pick something from your bucket list. We’ve all got one, so why not take this opportunity to cross something off the list. It could be a parachute jump, balloon ride or driving lessons in a sports car. Is it going to be an intimate ceremony with just the two of you, or would you like to open up the occasion for a few family and friends? Do you want to hold it in the same location as you first took your vows, or have you found somewhere that is now more meaningful for the pair of you? Have you always dreamt of a fairytale wedding, but never had the means to make the dream come true? Until now that is! Whatever you decide, we’re pretty sure it’ll be perfect. Showing your love for each other in this very public way, will make you feel good and those around you. There are no set rules to follow, or etiquette you need to be concerned about. It’s all about what you want this time round, with no pressure from family to do things the “right way”. 25th wedding anniversary gifts don’t have to break the bank to be special. Many couples would appreciate a homemade gift far more than anything bought from a store. If you decide to make a gift then the colour or material it’s made from doesn’t necessarily have to be silver. The thought and effort that has gone into making the gift matters more. Doesn’t matter how old you are, your parents will always appreciate a handmade gift, because it has a certain special touch. You’ve also got the upper hand when it comes to finding photos, and personal items, as you’ve got easy access, and should be able to do things without raising too much suspicion. Without taking any of the family heirlooms, a couples kids can take copies and make them into a collage or quilt, compile a CD of songs from their wedding day, make hand printed t-shirts, create a book of coupons for the daily chores. It can be quite a challenge finding anniversary gifts for friends. After all they’ve probably most of the things they could possibly need. But use a little bit of your imagination, and you’re bound to come up with something they’ll treasure. But don’t despair if you’re struggling for ideas, because we’ve got a few we can share…….an astrological compatibility chart, for example. How about turning a wedding photo into a jigsaw puzzle? Add a box of chocolates and a bottle of wine for the couple to enjoy while completing the picture. You could also gather together a few photos of the couple to pop in a scrapbook. Leaving space of course, for pictures from the years to come. Have a bit of fun with some hand decorated t-shirts. “My husband/wife has the best partner ever”, or “I belong to him/her” are two great ideas. Create a collage together, filling it not just with pictures but momentos you’ve gathered over the years. There are plenty of avenues to explore when it comes to choosing anniversary gifts, whether it’s silver, gold or your very first wedding anniversary. Pick something that expresses your feelings about each other, or the happy couple and you won’t go far wrong.